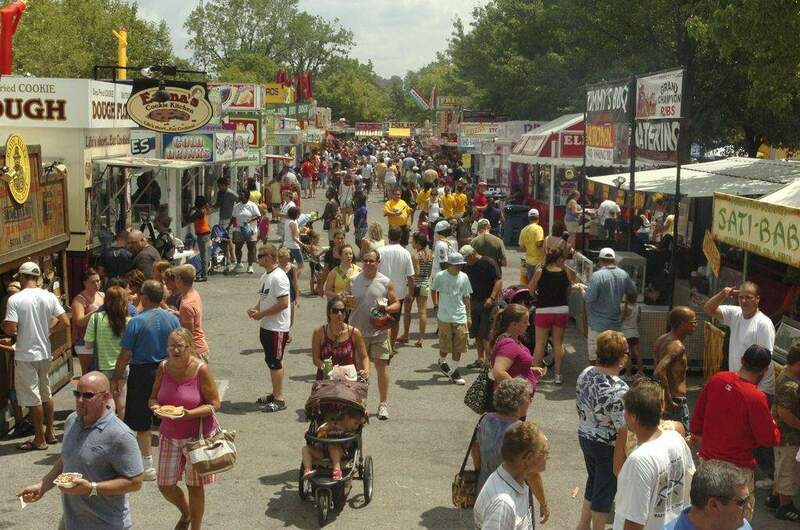 FILE: Revelers at Three Rivers Festival's Junk Food Alley. The population in most northeast Indiana counties, topped by Allen County, continued to grow this decade, according to recent census estimates. Allen County has grown an estimated 4 percent to 370,404 since 2010, adding more than 14,000 people. Most of that change came naturally from more births than deaths, not from people moving in. The only northeast Indiana county to lose people was Huntington County, which declined 2 percent this decade to an estimated 36,400. Births were not enough to offset more than 800 people who left the county. The population count came before the county's largest employer, United Technologies Electronic Controls, began last month to lay off more than 700 employees as it shifts production to Mexico. “It's that Rust Belt, aging population that I think everyone deals with here in northeast Indiana,” Fetters added. Noble, Steuben and Whitley counties showed no change in population. Across the state, counties around Indianapolis continue to lead growth. Hamilton and Boone counties each had increases of 14 percent this decade, the state's highest. Along with Hancock, Johnson and Hendricks counties, Boone and Hamilton had 2 percent single-year growth between 2015 and 2016, topping the state, according to estimates. Hamilton has nearly tripled in size since 1990 to 316,373 residents. Ranked 12th in 1990, Hamilton – home to Fishers, Carmel and Noblesville – is now the fourth largest county, zeroing in on third-ranked Allen. Marion County, home to Indianapolis, is in no danger of losing its top spot with 941,229 residents. Second-ranked is Lake County – home to Gary, Hammond and Merrillville – with 485,846 people. Nationwide, topping the list of large counties with single-year population declines were Cook County (Chicago), Illinois, with a loss of 21,324 people, and Wayne County (Detroit), Michigan, with 7,696 fewer residents. North Dakota, an oil-boom state, had four counties that were among the fastest growing in 2015 sharply drop in rank because of people moving out. Maricopa County (Phoenix), Arizona, replaced Harris County (Houston), Texas, as the county with the nation's highest annual population growth. Harris County was the largest numeric gainer for eight years in a row. Maricopa County gained 81,360 people between July 1, 2015 and July 1, 2016, or about 222 people per day, while the nation's second-largest population gainer, Harris County, gained 56,587 people, or about 155 people per day on average. Maricopa County primarily grew through the addition of 43,189 residents from net domestic migration, a measure of how many people move to or from parts of the United States. The county also added 25,428 people from more births than deaths and 10,188 people from net international migration.